What better way to learn methods than through fascinating studies? 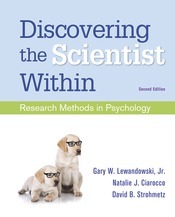 Discovering the Scientist Within is the only book on the market that teaches students about research methods using a case study approach. All the design-focused chapters present students with a single study described from start to finish. The chapter starts by asking students to consider a scenario and then walks them through the steps of the study: formulating a research question, performing a literature review, constructing a data collection method, considering ethics, refining the method, gathering data, understanding the statistical results, and reporting the results in APA style. Students come away with a practical understanding of the research process and useful practice in the basic steps that comprise all studies. The book also has excellent pedagogy, starting with clear Learning Outcomes at the beginning of each chapter, “Your Turn” assessments as the end of each section, and end-of-chapter Review Questions and Applying What You’ve Learned activities. As part of their class projects, students are often asked to run some statistics and write in APA style. This text has ample support for both, including Appendices on both topics, as well as in-chapter material modeling writing and reporting in APA style. Best of all, the book comes integrated with new Research in Action activities from the same author team. These activities extend the core mission of the book by putting students in the role of a researcher and simulating the kinds of decisions they would face in conceptualizing and executing a study. Each chapter includes an activity (a few chapters have more than one), and the activities are called out in the chapter. The new edition features coverage of “fake news,” as well as “Our Research Plan at a Glance,” a summary of the study featured in each chapter. The book is also available in a LaunchPad course for the first time. Students will have access to the full eBook, the LearningCurve adaptive quizzing system, the Research in Action activities, and other resources. This book also comes with an unprecedented set of instructor supplements, many of them prepared by the authors themselves. These include a full instructor’s manual, including supplemental examples for each chapter, suggestions for in-class activities and demonstrations, lab/group project ideas, a feature designed to enhance psychological/information literacy, and suggestions for using end of chapter materials. Instructors also get access to unique PowerPoint slide decks that incorporate the same active learning and hands-on approach as the textbook. Chapter PowerPoint slides include additional examples, discussion questions, demonstrations and activities built right into the presentation to help bring the material to life. For design chapters, they provide two sets of PowerPoint slides: one set that incorporates the chapter’s research question and a more traditional set that focuses on key concepts.